Eurodollar is still moving downwards. Possibly, pair may beak current minimum during Wednesday. If later price rebounds from lower levels, market may start new correction. Yesterday, after pair completed correction, I opened one more sell order. Market has almost reached level of 38.2%. According to analysis of temporary fibo-zones, predicted targets may be reached during the day. Franc continues breaking maximums; market has almost reached several fibo-levels located in upper area. I’ve moved stops on my buy orders to latest maximum in order to secure some part of profit. 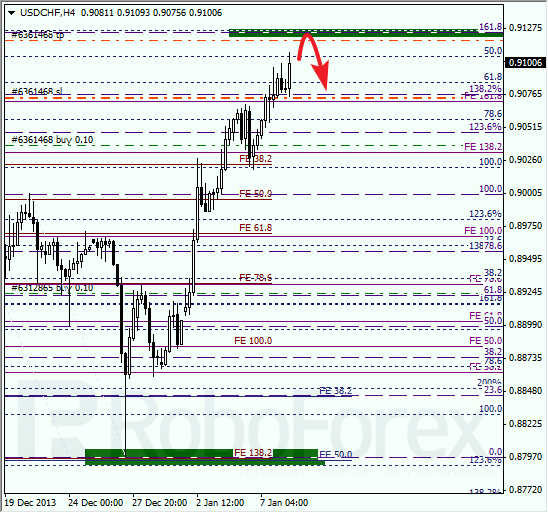 At H1 chart we can see, that market is about to reach temporary fibo-zone quite soon. Local correction, which took place earlier, turned out to be quite short, and then price broke maximum. In the near term, instrument is expected to start deeper and more serious correction.